We could not decide on where to go caching on Saturday. The weather did not look too great all over the UK but seemed it might be better the further south you were. We’d seen a new series of 40 or so caches on a nice looking circular walk in the Cotswold’s come out a week or two ago so this sounded like it might be for us today. It’s quite a bit further than we usually go, but after checking the approximate walking time with someone who had already done the caches it looked like it was eminently possible. We did not arrive at the starting point until 11am as it did indeed take quite a while to get there, not helped being stuck behind a really slow car towing a caravan for most of the journey from the motorway. The road was too windy to get past them safely so we were stuck. We parked up by the bonus cache dummy co-ords in the middle of the village and got our waterproofs on as it was raining lightly. The series is split into two loops, one to each end of the village. We decided to tackle the northern loop in the morning as it looked slightly longer, return to the Jeep for our sandwiches and then do the southern loop later on. Each cache has a clue in which then gives you the co-ords for the bonus cache. As we approached the first cache, we realised it was the one you were supposed to do after you had finished the series and on the walk back to the car. Doh – looks like we’ll be doing the series backwards, which we often seem to do. After this cache, there was something like a 0.7 mile gap until the next cache (which was the last cache in the main series). We were chatting on the way and suspected the bonus cache was somewhere along this stretch as we could see no other reason not to have at least one other cache here. As we walked along, we spotted a really nice spot for a cache and Isaac saw a likely looking cache tree. A quick pop round the back of the said tree and we could see some camo bag sticking out of a hole :-). Bingo – we’d found the bonus cache! We then carried on round the rest of the caches in the loop as intended. It was still drizzling but we had out waterproofs on and were nice and snug. All the caches were incredibly easy finds. We found this when we did the UK Mega series and wondered if all caches down south are this easy or just the ones on the bigger circular walks. Either way, we appreciated it as the last thing you want is a long search while on a long walk. All too soon we arrived back at the Jeep for dinner. The rain had just about stopped and there were small glimpses of blue sky. We had our sandwiches, stocked up with more drinks for the next part of the walk and off we set. The final loop had slightly more terrain to it as the bottom end of the walk was by some lovely woodland overlooking the whole area. When I say slightly more terrain, it was only a gentle slope and nothing much. Several more easy finds later and we were back at the Jeep. It was about 4pm now so we decided to start heading home as it would take a few hours to get back, but not before a quick Sidetracked cache not far from where we parked. Isaac then guided us back to Stow in the Wold and the main road north to the M40 by Warwick. He took us via a couple of quick drive-by’s in Stow and then another Sidetracked in Moreton in the Marsh. We loved the towns in the area with their gorgeous yellow tinted stone buildings. Moreton was especially nice. 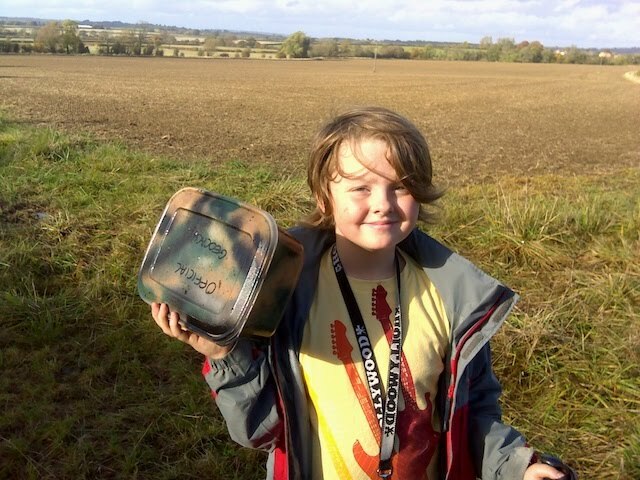 Just before we got to the M40, Isaac took us round the airfield at Wellesbourne to a quick cache. I was telling how I’d landed at Wellesbourne a few times now and that they had an old Vulcan bomber on the airfield which I think people are trying to restore. The road by the side of the airfield gave us a great view of the Vulcan, which we both enjoyed :-). One final cache just by the M40 junction saw the total for the day at 47 finds. We’d have loved to find another 3 to get a round 50 finds for the day but we were too hungry and just wanted to get home now. A very different than normal day out in an area we’ve never cached in before. We’ll have to come this way more often as there are tons of caches to find.